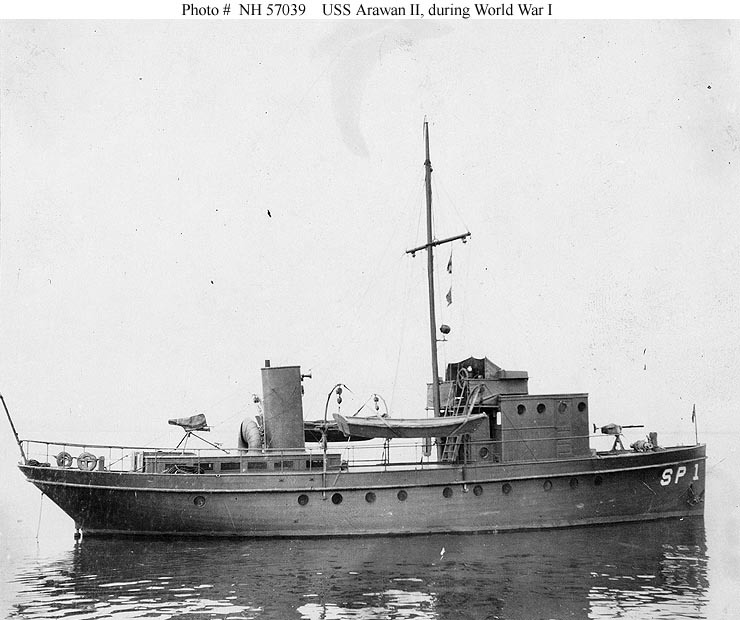 ↑USS Arawan II (SP-1). Photographed during World War I. 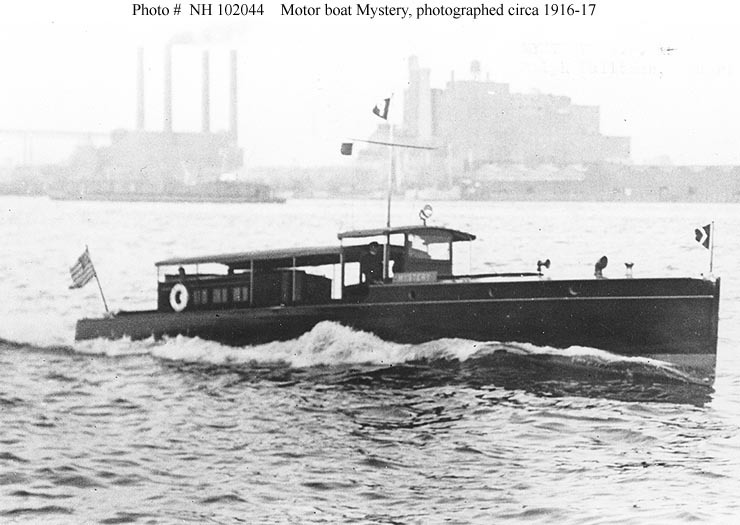 This motor boat was built in 1912 as a pleasure craft. She was acquired by the Navy on 27 March 1917 and commissioned a few weeks later. She was returned to her owner on 29 November 1918. U.S. Naval Historical Center Photograph. 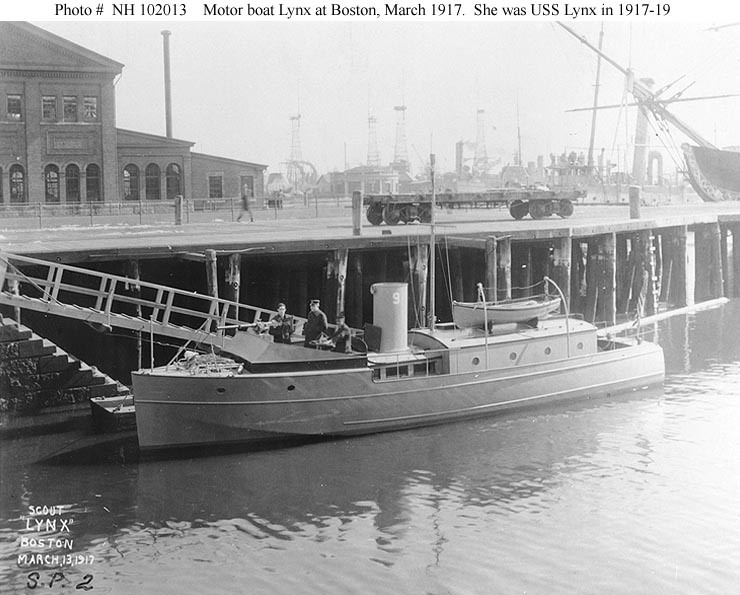 ↑Lynx (U.S. motor boat, 1916). Photographed at the Boston Navy Yard on 13 March 1917, with Navy personnel on board and a gun mounted. She was formally acquired by the Navy on 21 April 1917 and commissioned on 9 July 1917 as USS Lynx (SP-2). Stricken on 24 August 1919, she was disposed of by burning on 4 September 1919. Several battleships are in the distance. The bow of USS Constitution is at right. The original print is in National Archives' Record Group 19-LCM. U.S. Naval Historical Center Photograph. ↑USS Tacony (SP-5). In port on 29 November 1918, the day she was returned to her owner. 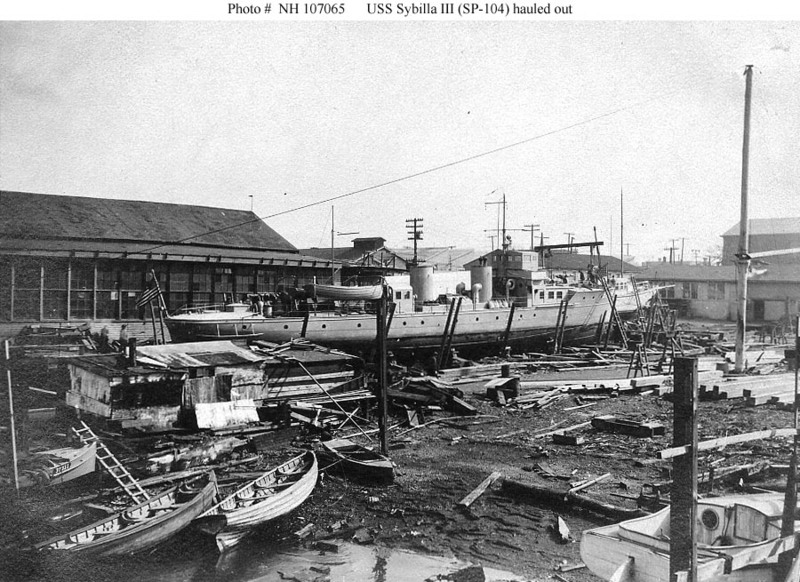 She was built in 1911 as the pleasure craft Sybilla II and delivered to the Navy for World War I service on 24 May 1917. U.S. Naval Historical Center Photograph. ↑USS Patrol No. 4 (SP-8). Underway, during World War I. Built in 1915, this motor boat was commissioned for Navy service on 18 April 1917. She was returned to her owner on 17 March 1919. Note her bow marking "S.P.No.8" and canvas covered machine gun on the foredeck. U.S. Naval Historical Center Photograph. 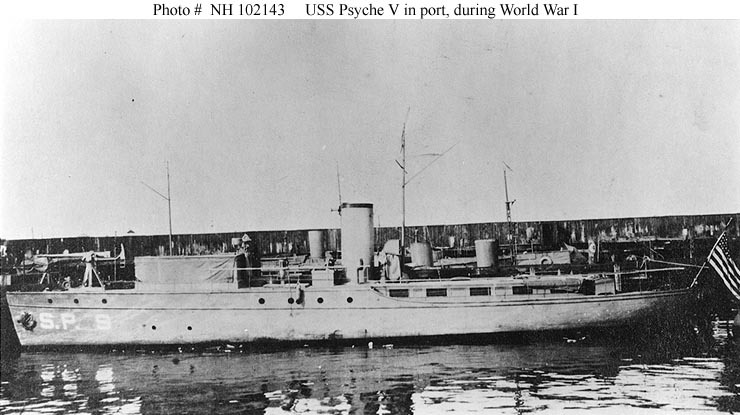 ↑USS Psyche V (SP-9). In port during World War I. Built in 1911 as a pleasure craft, and formerly named Achelous, she was acquired by the Navy on 2 May 1917 and commissioned on 15 June 1917. Her assigned armament was one 1-pounder gun. Psyche V was transferred to the Department of Commerce on 16 June 1919. The original print is in National Archives' Record Group 19-LCM. U.S. Naval Historical Center Photograph. ↑Siwash (American Motor Boat). Underway prior to her World War I Navy service. Photographed by Morris Rosenfeld, New York. 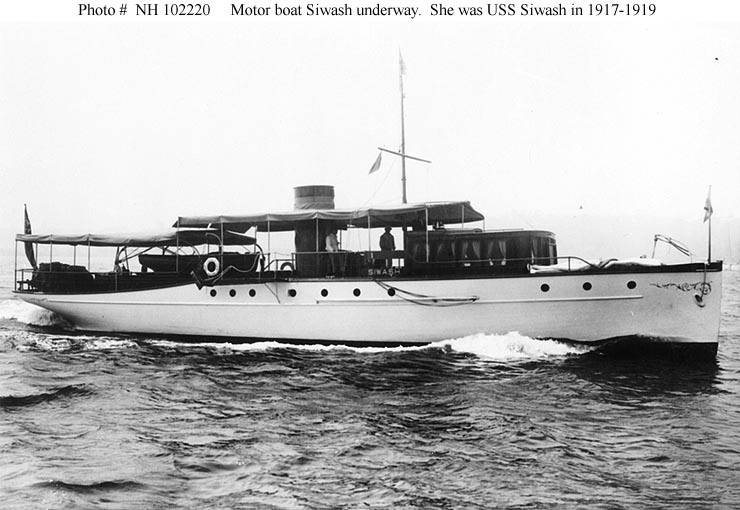 This pleasure craft was acquired by the Navy on 18 June 1917 and commissioned on 18 August 1917 as USS Siwash (SP-12). She was transferred to the Department of Commerce on 16 June 1919. The original print is in National Archives' Record Group 19-LCM. U. S. Naval Historical Center Photograph. 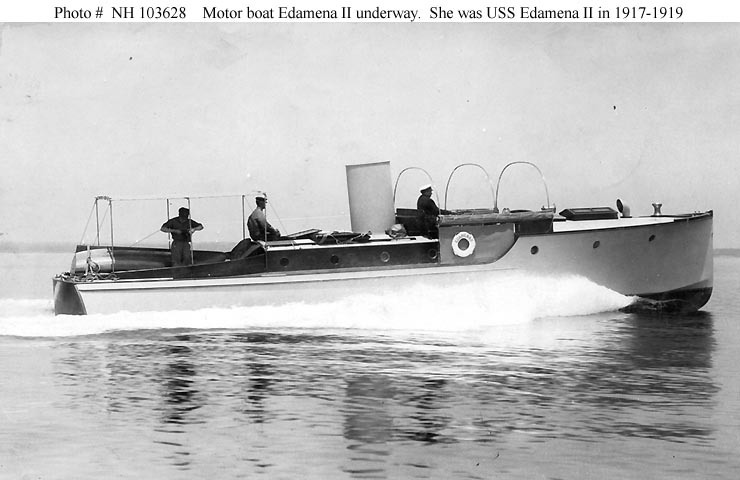 ↑Edamena II (American Motor Boat). Underway, circa 1916-1917. 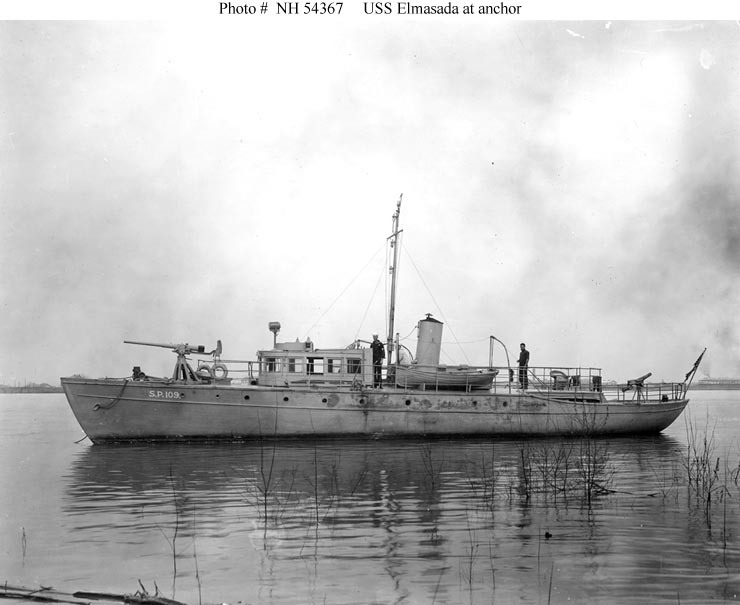 This pleasure craft served as USS Edamena II (SP-14) in 1917-1919. U.S. Naval Historical Center Photograph. 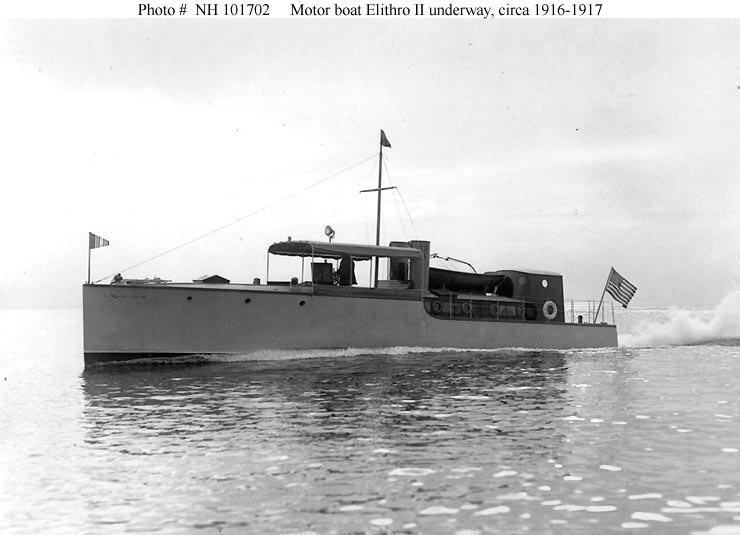 ↑Elithro II (American Motor Boat). Underway, circa 1916-1917. Photographed by Publisher's Photo Service, Stamford, Connecticut. 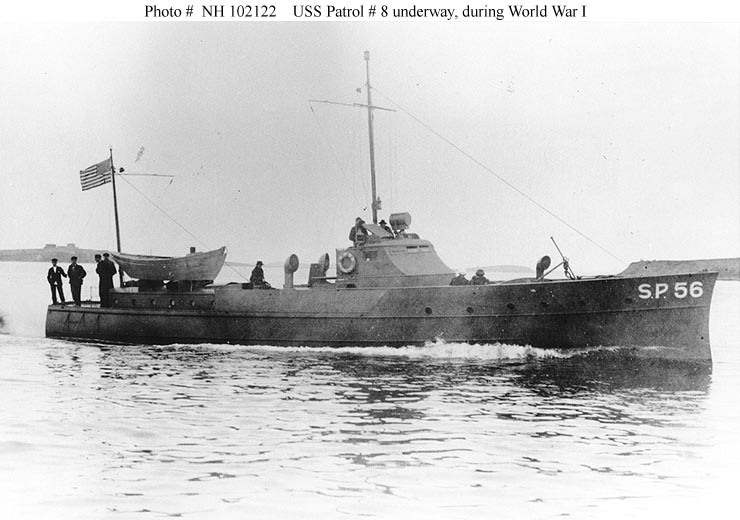 This pleasure craft served as USS Elithro II (SP-15) in 1917-1918. Note that she has two small funnels abreast, with her SP number on the one nearest the camera. The original print is in National Archives' Record Group 19-LCM. U.S. Naval Historical Center Photograph. ↑Mystery (U.S. Motor Boat). Photographed circa 1916-1917. 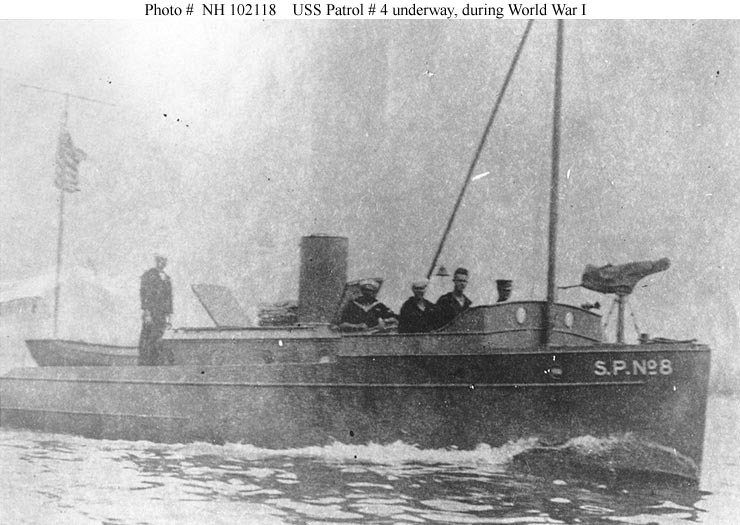 This boat was given the Navy registry number SP-16 in 1917, but was not taken over for Naval service. 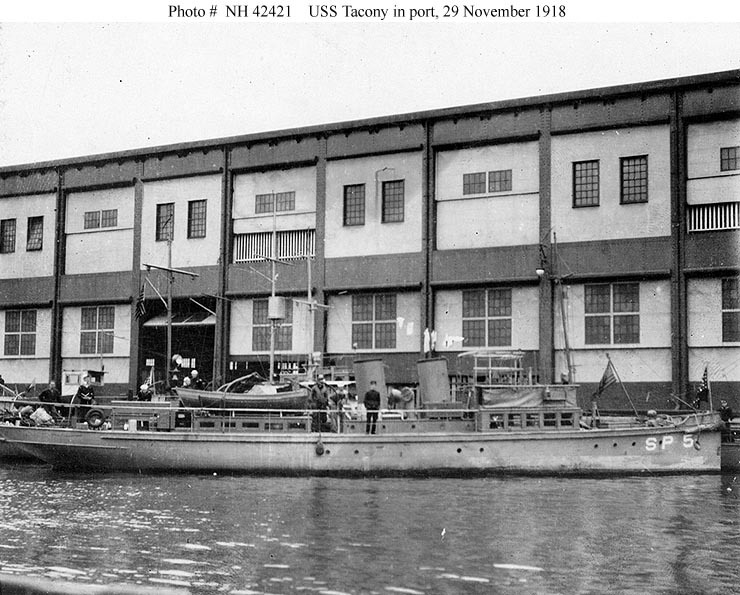 She has been confused in some sources with another motor boat of the same name, which became USS Mystery (SP-428). The original print is in National Archives' Record Group 19-LCM. U.S. Naval Historical Center Photograph. 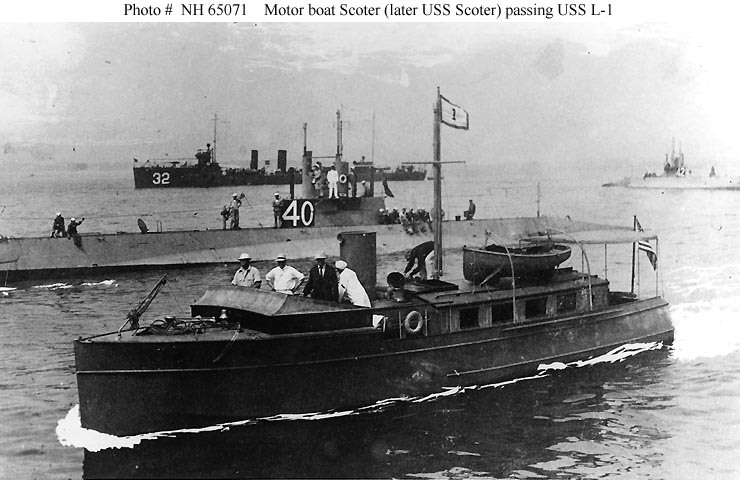 ↑Scoter (American Motor Boat). 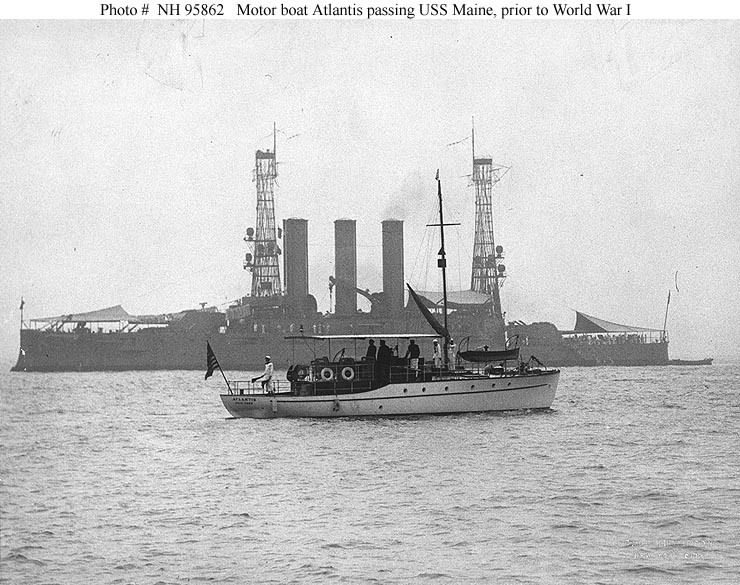 Passing USS L-1 (Submarine # 40) while underway, probably in 1916. USS L-3 (Submarine # 42) and USS Monaghan (Destroyer # 32) are in the background. This pleasure craft, built by George Lawley & Son of Neponset, Massachusetts, became USS Scoter (SP-20) in 1917. U.S. Naval Historical Center Photograph. ↑Barracuda (American Motor Boat). Photographed circa 1916. This craft was inspected for possible use as a section patrol boat by the Third Naval District and assigned registry # SP-23. However, she was not taken over and remained in civilian hands during World War I. U.S. Naval Historical Center Photograph. ↑Mauna Loa (American Motor Boat). Underway, circa 1916. 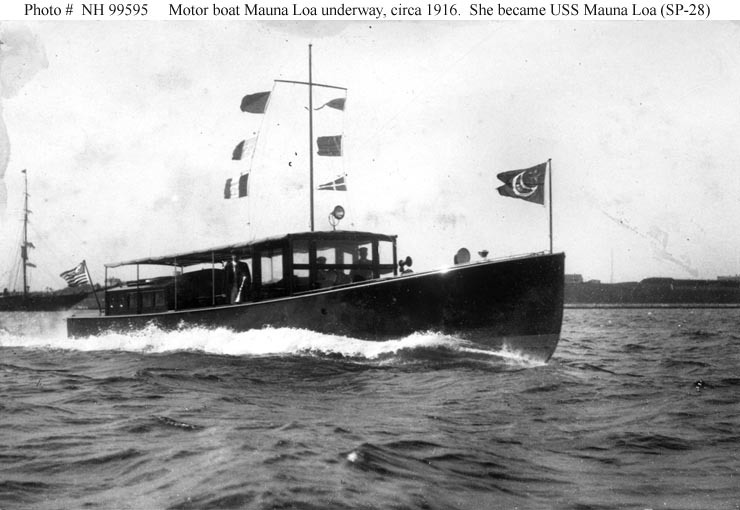 This pleasure craft served as USS Mauna Loa (SP-28) in 1917-1918. U.S. Naval Historical Center Photograph. 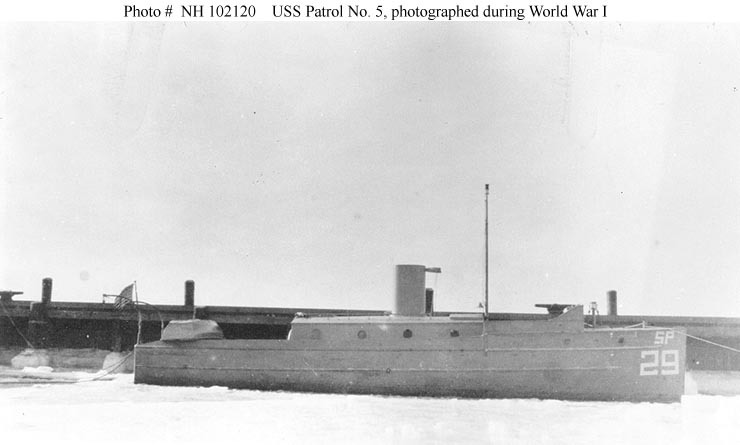 ↑USS Patrol No. 5 (SP-29). Photographed during World War I. Built in 1916, this motor boat was acquired by the Navy on 7 April 1917 and commissioned on 13 April 1917. She was sold on 23 April 1919. The original print is in National Archives' Record Group 19-LCM. U.S. Naval Historical Center Photograph. ↑Chingachgook (American Motor Boat). Underway at high speed, October 1916. Photographed by Edwin Levick, of New York City. Though flying yachting flags, she is armed with a Colt machine gun forward and a small cannon aft, probably for service with the pre-World War I Coast Defense Reserve. 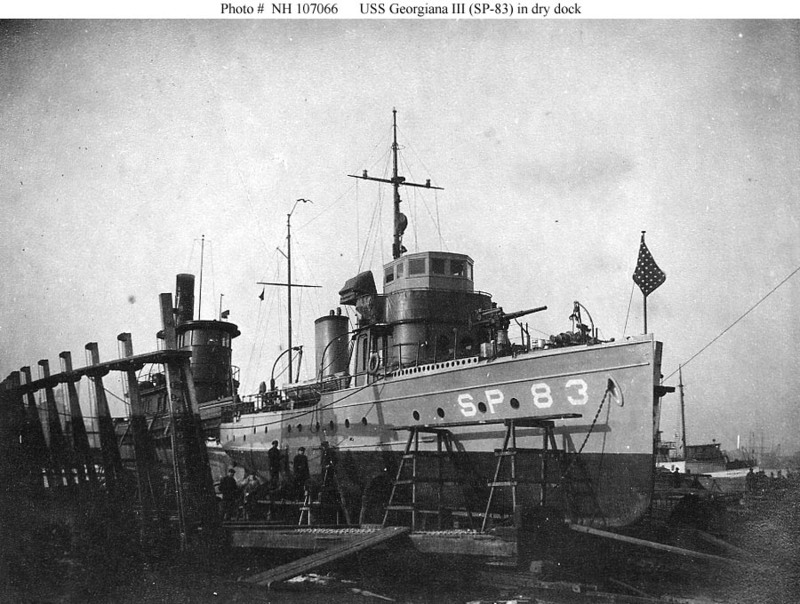 This civilian craft was acquired by the Navy on 25 May 1917 and placed in commission on 6 June 1917 as USS Chingachgook (SP-35). Essentially destroyed by a gasoline explosion on 31 July 1917, she was decommissioned on 10 January 1918 and disposed of by burning on 19 February 1918. U.S. Naval Historical Center Photograph. ↑Mustang (American Motor Boat). Underway prior to World War I. 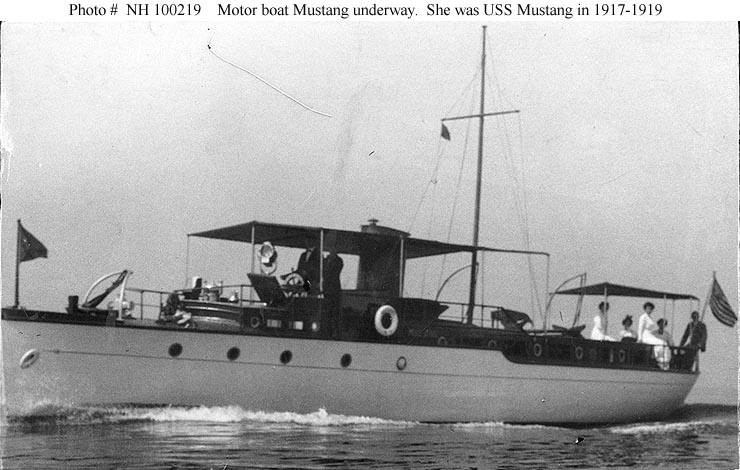 This pleasure craft was purchased by the Navy on 6 July 1917 and placed in commission on 2 October 1917 as USS Mustang (SP-36). She was sold on 23 July 1919. U.S. Naval Historical Center Photograph. ↑Dawn (American Yawl). 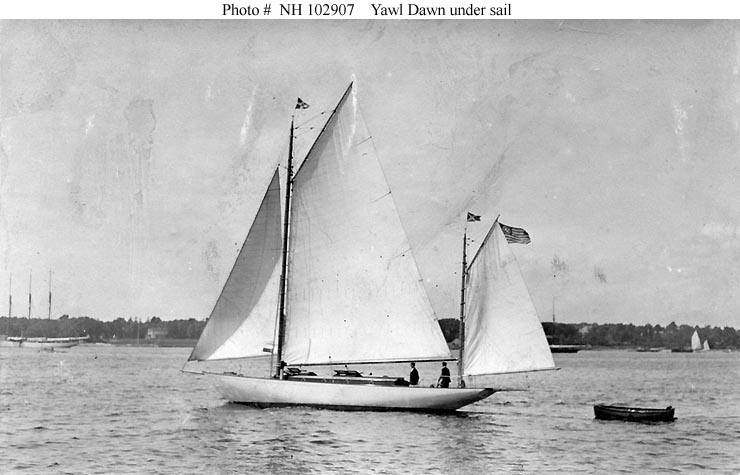 Under sail in northeastern U.S. waters, circa 1916-1917. 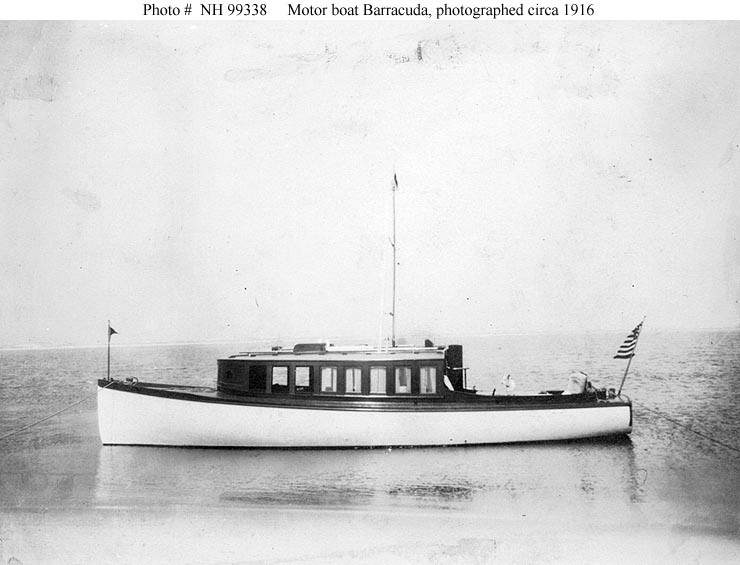 This pleasure craft, owned by Franklin Farrel Jr., of Ansonia, Connecticut, was ordered to be delivered to the Navy by letter of 14 May 1917. Assigned the registry # SP-37, she was apparently unsuitable for Naval purposes as the lease agreement covering her was cancelled on 7 June 1917. Dawn was returned to her owner on 18 December 1917. U.S. Naval Historical Center Photograph. ↑Atlantis (American Motor Boat). Passing USS Maine (Battleship # 10), prior to World War I. Photographed by Paul Thompson, New York. This pleasure craft was acquired by the U.S. Navy on 2 July 1917 and placed in commission on 27 September of that year as USS Atlantis (SP-40). She was stricken from the Navy list on 7 July 1919 and later sold. U.S. Naval Historical Center Photograph. ◎3rd Naval District/9th Naval District. 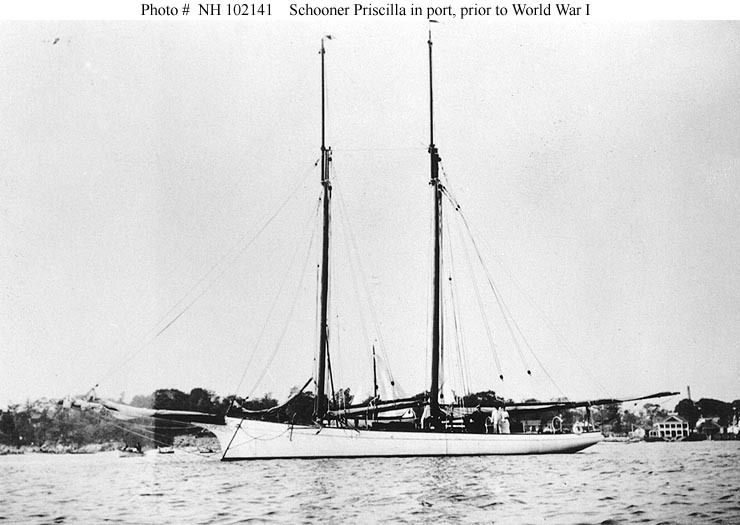 ↑Priscilla (American Schooner). Photographed in port, prior to World War I. This schooner was delivered to the Navy on 19 June 1917 under the registry number SP-44. However she was not taken into service and was returned to her owner on 17 December 1917. The original print is in National Archives' Record Group 19-LCM. U.S. Naval Historical Center Photograph. ↑USS Patrol No. 1 (SP-45). Photographed in coastal waters, during World War I. Built in 1916, the civilian motor boat Patrol No. 1 was acquired by the Navy for World War I service and commissioned on 4 May 1917. Stricken from the Navy list on 13 June 1919, she was destroyed by a hurricane at Key West, Florida, on 11 September 1919, before her sale was completed. The original print is in National Archives' Record Group 19-LCM. U.S. Naval Historical Center Photograph. ↑USS Patrol No. 8 (SP-56). Underway during World War I. 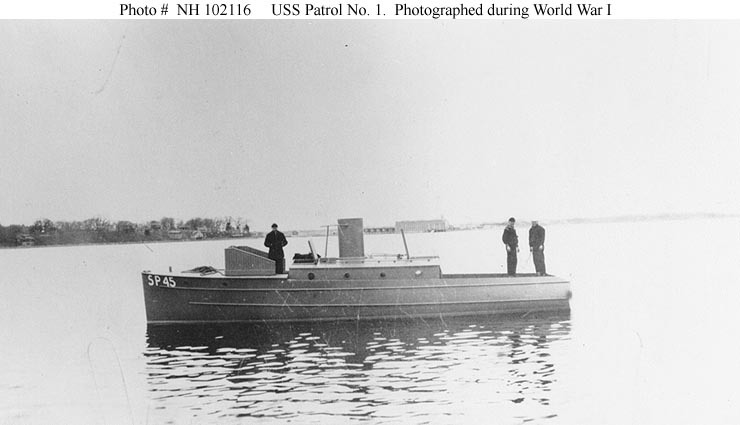 Built in 1916 by Murray & Tregurtha, South Boston, Massachusetts, this motor boat was acquired by the Navy on 10 May 1917 and commissioned one day later. Following World War I service, she was returned to her owner on 18 February 1919. The original print is in National Archives' Record Group 19-LCM. U.S. Naval Historical Center Photograph. ◎4th Naval District/7th Naval District. ↑Zenith (SP-61) in a light gray finish, her hull number in small white characters at her bow, and a rapid-firing 3-pounder gun on her forecastle. This yacht was designed with the possibility of naval service in mind. ◎1st Naval District/5th Naval District. ◎Atlantic Fleet. Santo Domingo 1920-1921. 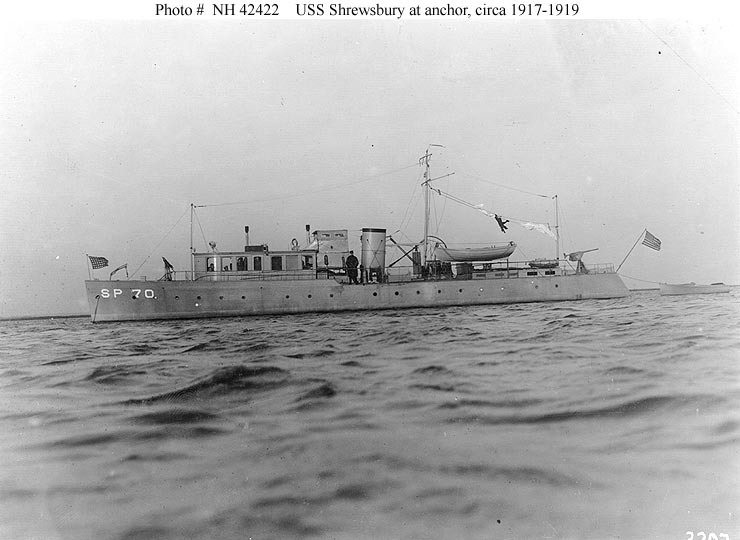 ↑USS Shrewsbury (SP-70). Photographed in 1917-1919. U.S. Naval Historical Center Photograph. 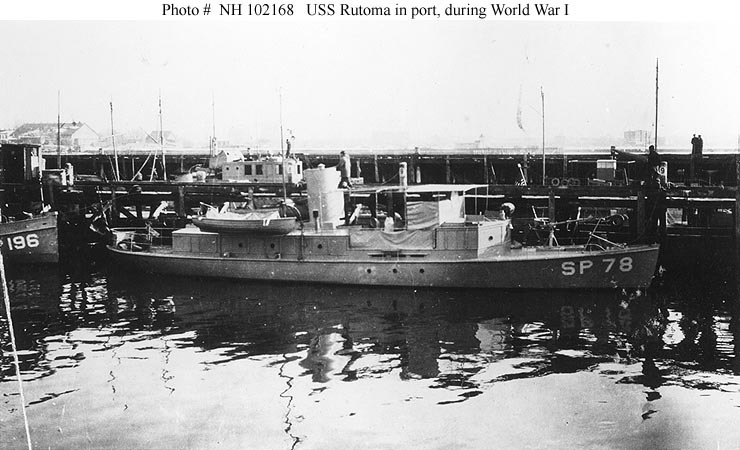 ↑USS Rutoma (SP-78). In port during World War I. USS Edith M. III (SP-196) is partially visible at left. 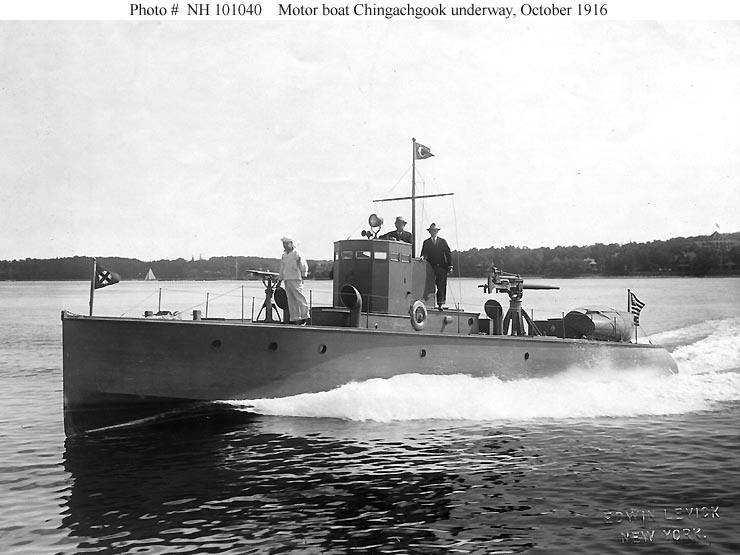 Built in 1910 and previously named Manchonak, the motor pleasure boat Rutoma was acquired by the Navy on 30 April 1917 and commissioned on 26 June 1917. She was stricken on 13 June 1919 and sold on 16 September 1919. The original print is in National Archives' Record Group 19-LCM. U.S. Naval Historical Center Photograph. 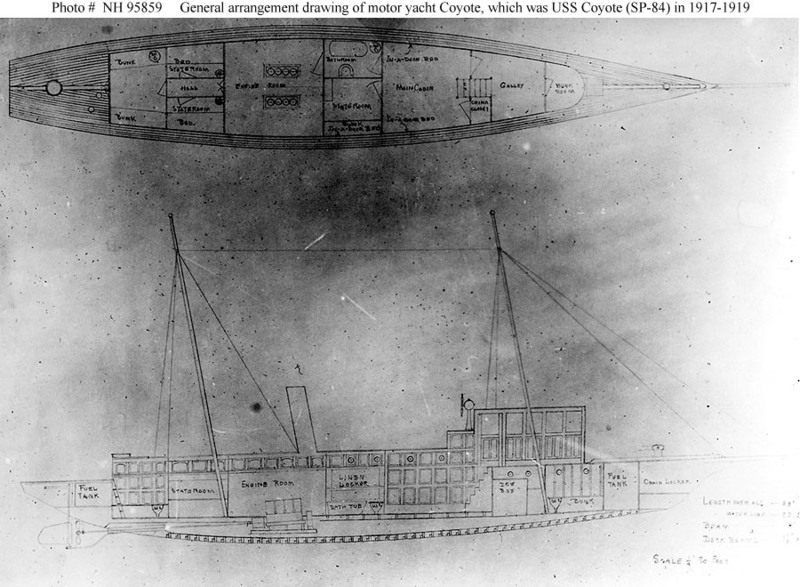 ↑USS Coyote (SP-84). In the boat basin at Great Lakes Naval Training Station, Illinois, circa 1917. She is still wearing her civilian color scheme, with "Coyote of Chicago" on her transom. Note the Sailors on deck with M1903 "Springfield" rifles, and the 1-pounder automatic guns mounted at Coyote's bow and stern. Donation of Dr. Mark Kulikowski, 2006. U.S. Naval Historical Center Photograph. ↑Coyote (American Motor Boat). General arrangement drawing, which accompanied a report dated 10 March 1917. 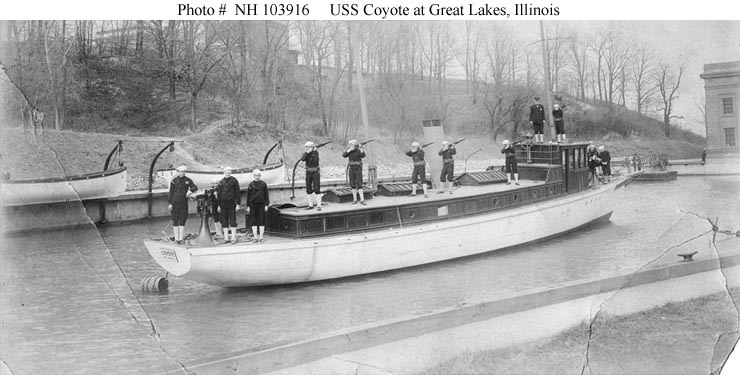 This motor yacht was acquired by the Navy on 7 April 1917 and subsequently served as USS Coyote (SP-84). She was stricken on 17 June 1919 and sold on 13 December 1919. The original photograph is in Record Group 19-LCM in the National Archives. U.S. Naval Historical Center Photograph. 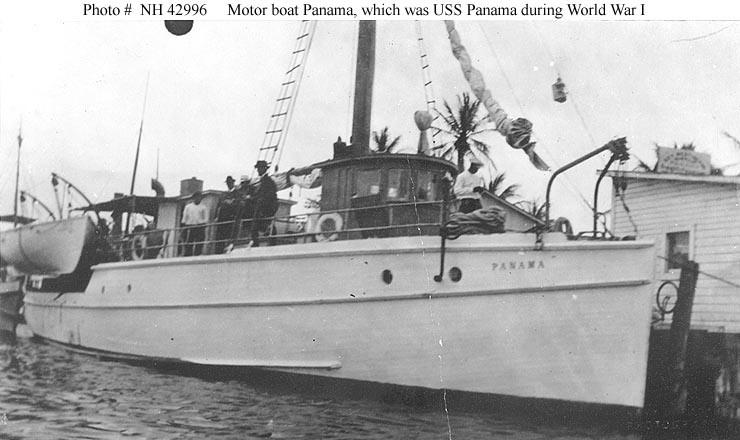 ↑Panama (American Motor Boat). Photographed in a Florida port, prior to World War I. She served as USS Panama (SP-101) in 1917-1920. U.S. Naval Historical Center Photograph. ↑USS Shadow III (SP-102). 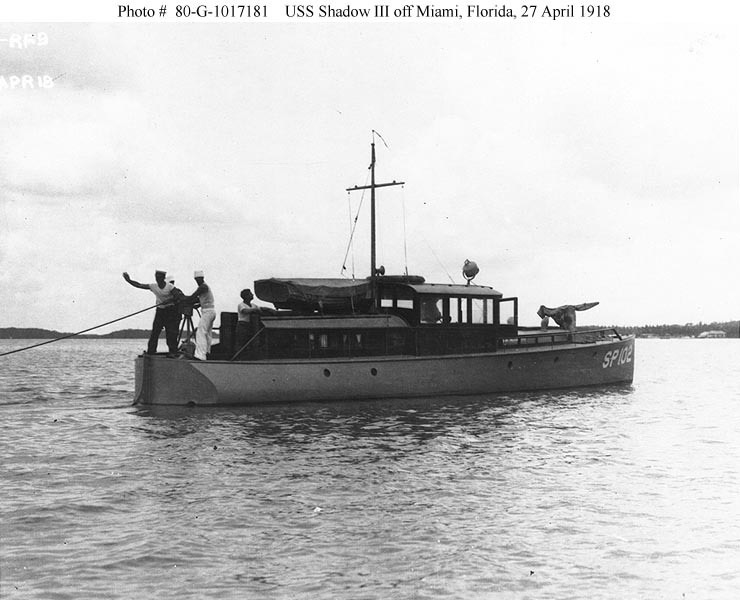 Off Miami, Florida, 27 April 1918. Official U.S. Navy Photograph, now in the collections of the National Archives. 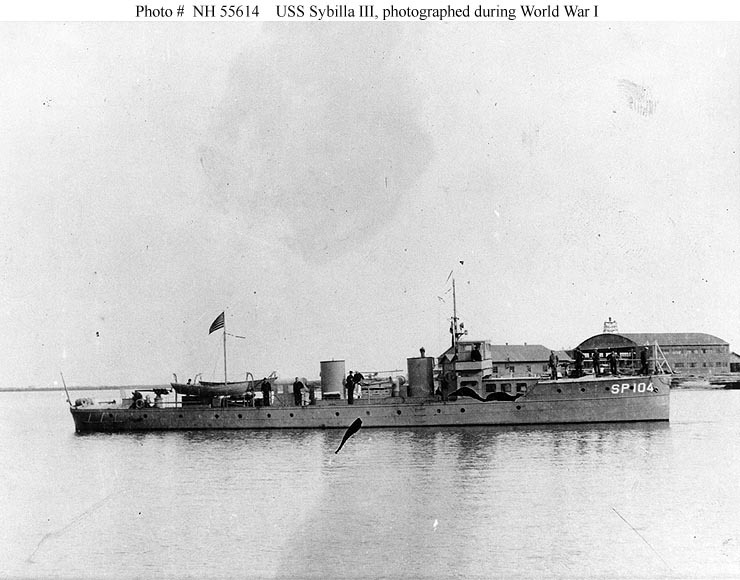 ↑USS Sybilla III (SP-104). Photographed during World War I. This yacht also saw World War II service as USS PC-454 and USS Impetuous (PYc-46). U.S. Naval Historical Center Photograph. ↑Calabash (American Motor Boat). In a Florida harbor, prior to World War I. 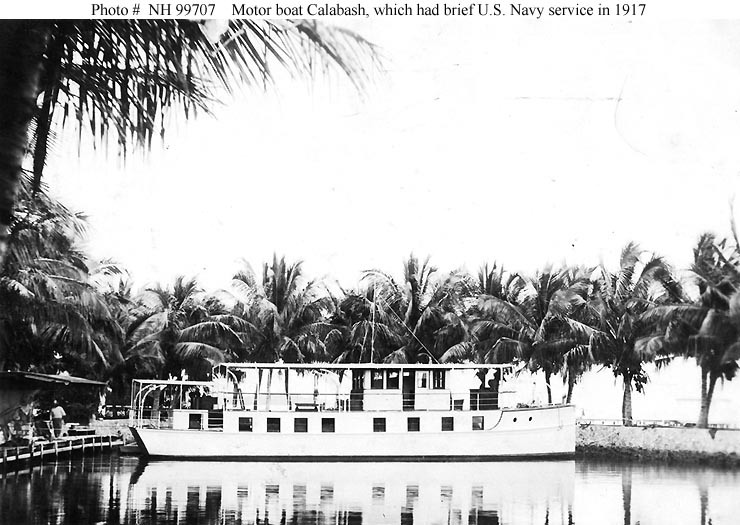 This light-draft pleasure craft briefly served as USS Calabash (SP-108) in 1917. U.S. Naval Historical Center Photograph. ↑USS Elmasada (SP-109). At anchor, during the World War I era. U.S. Naval Historical Center Photograph.